Because it’s the holiday season, my favorite paranormal romance has been on my mind. Every year around this time, I have to watch the 1958 movie Bell, Book and Candle. 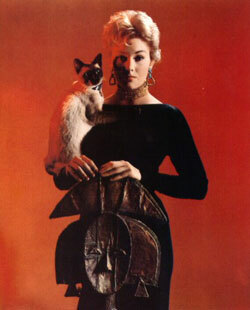 The pivotal scene in the movie takes place on Christmas Eve, when urban witch Gillian Holroyd (Kim Novak) uses her familiar, Pyewacket, to cast a love spell on unsuspecting Shep Henderson (Jimmy Stewart). It was the kind of thing my friends and I were always making up in grade school. We all wanted to imagine ourselves as women with some kind of supernatural power—whether it was witchcraft or a bionic arm—and inevitably, there would be an episode in this serial game of imagination where we “lost our powers” because of some powerful male villain. Yeah, no Jungian metaphors floating around in there at all. But Shep Henderson wasn’t a villain. He was Gillian’s love interest, and falling in love with him was what made her lose her powers. It’s the one part of the story that doesn’t work for me, the sappy romantic ending in which Gillian is no longer the fascinating, strong woman in black pants and bare feet, but a teary-eyed, meek, almost childlike woman in a pastel yellow dress and pumps. The most telling thing to me about the ending is that her cat doesn’t like her anymore. Always listen to your cat. From the first time I saw the movie, I wished it had a better ending. I still adore it, it’s charming and romantic, but I’d adore it more if Gillian hadn’t had to give up all her power to be loved. Not only are there women who can be powerful and still find love in paranormal romance and urban fantasy, but these forward-thinking genres are increasingly home to male demons who find love with male demons, and female vampires who find love with female vampires, and numerous permutations in between. LGBT characters are no longer the ones who have to die tragically or provide comic relief. They’re the heroines and heroes of their own stories. When I wrote my House of Arkhangel’sk trilogy, I hadn’t even heard of m/m romance, or paranormal romance for that matter. I had my head buried deeply in traditional epic fantasy, where such elements are not commonplace. I worried that I’d never sell my series, and that if I did, I’d be asked to take out the romance between my boys. Fortunately, it isn’t 1958. Not only did no one ask me to tone down the romance in my unconventional series, they wanted more of it. Turns out, readers actual like smexy demon boys who like other smexy demon boys. And now my naughty demons are loose in the world, with the first book in the series, The Fallen Queen, available now, and Books Two and Three due out next year. You probably couldn’t get much farther from Gillian Holroyd than my demons—though you could read the underground society of Greenwich Village witches and warlocks of Bell, Book and Candle as a metaphor for the LGBT community of the time—yet I still credit her with sparking my imagination and setting me in motion along the path that led me here. 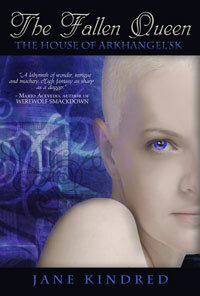 To enter to win a print or ebook copy of The Fallen Queen please leave a comment for Jane. The giveaway is international and provided by Jane, not me. As this title is more on the adult side I would suggest you be 18 or older to enter but am not asking for your age, just want you to be aware before you enter. Contest ends Monday, December 12th at noon MST. I'll use random.org to choose a random commenter and contact them that afternoon. The Fallen Queen sounds amazing and I love the cover, so striking! Best of luck with your new release! Thanks for offering the giveaway. My email is sonya @ sonyaclark.net. Fallen Queen sound right up my alley! Love the cover, too, Jane. Congrats on the new release with Entangled! 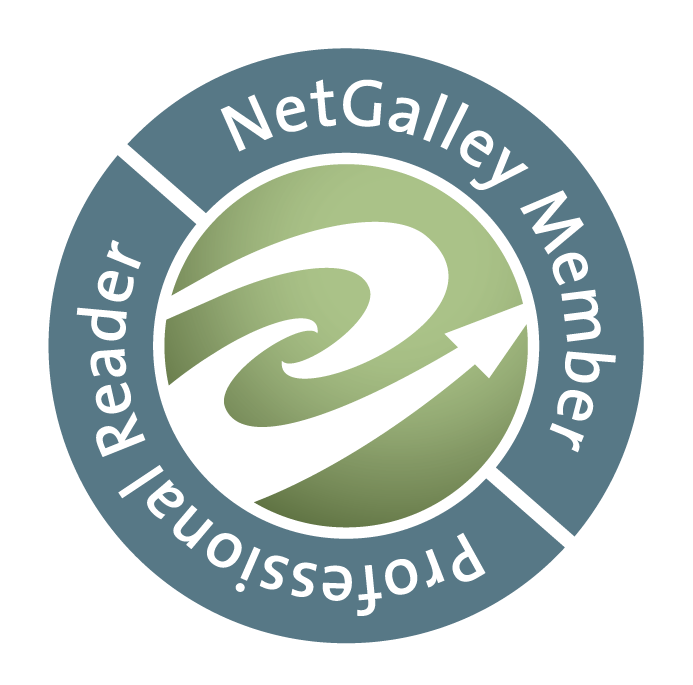 I enjoyed your guest post! I wished I could be Samantha (still do) from Bewitched where I could twitch my nose and the house would be clean and dinner ready! Wouldn't that be useful! As for books, I think the one that completely enveloped me was The Magician's Nephew by C.S. Lewis, the first in the Chronicles of Narnia book. I loved it!! Mine was the TV show " Buffy the vampire slayer" I was really young when they started broadcasting it in my country and I remember that I had to wait for my mom to go to bed so I can turn on the TV so she would not ground me (because it was on at 10 pm and I had to go to school the other day) and I was so scared to watch it but I still did. Ahh the good old times! Your book sounds so interesting, and I'd love to read it! I can't really remember what first "hooked" me on paranormal...but I've loved anything to do with fairies since I was very young. The book The Fairy Rebel by Lynne Reid Banks was probably one of my first favorites. I have always been attracted to paranormal books. I can't remember why it started. Every year for Halloween I always dressed as a witch. I just love it so much! I'm not sure if I can remember a paranormal story that made me say "Wow! I have to find more!" I think for me it was something I liked, and when I came across more I was pleasantly surprised. I'd rather look for an author's name than a theme, because the same theme might have been done by an author whose work I don't enjoy. I remember when you first mentioned "Bell, Book & Candle" and I googled it... there's a whole history behind the phrase, and some music that's absolutely beautiful. Oh, and the movie is cute too!